Add flour, sugar, butter and salt in a kitchen mixer and let it work for 1 minute. With the mixer still working (at low speed) add three tablespoon of ice cold water and let it work up until a crumbly dough will be formed. Transfer the dough on a flat surface and finish working it with your hands up until it will compact together. Cover the dough with some plastic paper or parchment paper and let it rest in the fridge for 1 hour. Divide the cold and firm dough in 4 parts and with the help of some parchment paper and a rolling pin I create 4 small circles 1/4 inch thick. Place the pastry dough circles in mini tart pans, trimming the edges where needed. In a cup I mix 1/4 Cup of sugar with 2 Tbsp of melted butter and spread 1/2 teaspoons of the mix at the bottom of the tarts. Slice the apple cuts in very very thin slices with a mandolin. Place the apple slices in a bowl. In a small cup mix together the remaining sugar (1/4 Cup), the remaining butter (2 Tbsp melted) and the lemon juice. Pour the mix on the apple slices and mix everything. 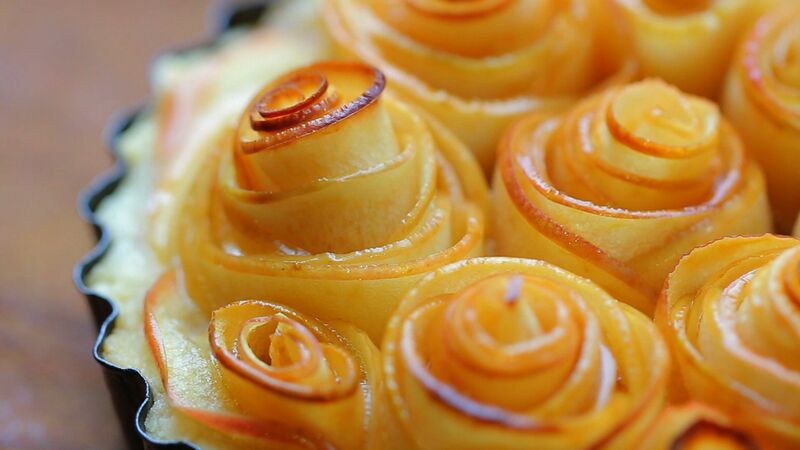 Place the apple slices in the microwave for 1 minute so that they will soften and it will be very easy to create the roses. Take one slice of apple and start rolling it with your hands very very tight. It will be the core of the rose. Keep adding apple slices up until you will reach the desired rose size. In order to give a more natural effect I decided to create small roses, big roses, just blooms. But you might want to realize roses of the same size..just play with your creativity. 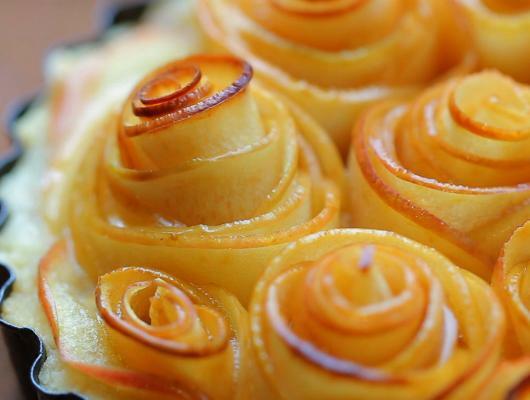 Gently place the first rose in the center of the tart and gently press it so that it will stay. Keep adding roses to cover the entire base of the tart. Bake the tarts in the oven (already preheated) at 375 F. for 25/30 minutes. Let the tart cool down for 5 minutes and enjoy!!! Stunning beautiful edible gift for mother's day. A delicate apple tart with butter and sugar cream and a crumbly crust.